Pinoy netizens are the best! 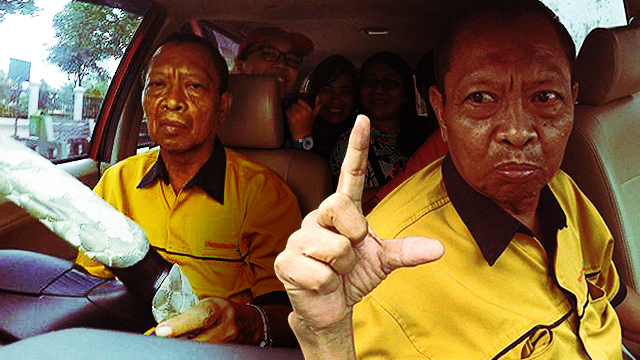 Photos and videos of an Indonesian taxi driver who looks like Vice President Jejomar Binay’s long lost twin brother have been making the rounds online. One of the photos uploaded by Facebook user Cess Barcenas showed the driver wearing a yellow shirt while flashing the "L" or "Laban" sign that presidentiable Mar Roxas II uses in his campaign. Apparently, Barcenas and her group were in Indonesia and was shocked after noticing their driver's striking resemblance with the vice president so they decided to have a little fun. Barcenas also couldn't help herself from posting a parody news item as a caption to their photos. Liberal Party candidate Mar Roxas revealed that Binay, after a Three-Hour meeting, has agreed to drop from the race in exchange that Mar's administration will turn a blind's eye on the alleged corruption by Binay, thereby allowing the latter to keep his millions. The uploaded content has been shared 4,561 times as of this writing.